Kindergarten teachers introduce their students to many new reading skills. Kindergarten teachers focus on reading skills for a large part of the instructional day. Because their students are beginning readers, teachers have to work on many skills simultaneously. These include alphabet recognition, phonics and decoding or sounding out words. Teachers begin working on comprehension skills at the beginning of the year. 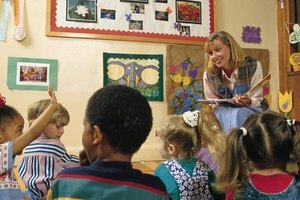 Although most kindergartners cannot read independently, they are capable of listening to adults read to them and can participate in comprehension exercises. Parents can also help their children at home with these activities that reinforce what they learn in class. Most teachers read aloud to their students every day. This is a direct instruction comprehension exercise. As children listen to stories they hear examples of fluent reading and are exposed to new words. This activity improves comprehension when teachers talk to the children about what she's reading. For example, after reading a few pages, the teacher will stop and discuss characters and setting. After she has read a story, the teacher will ask questions. She will begin with simple recall questions then progress to higher level thinking questions like "Why do you think the character was upset?" or "What would you do if this happened to you?" Parents can use these same techniques at home. 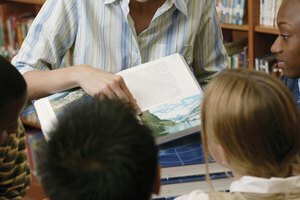 Think-alouds are comprehension exercises that help students make a connection to the story, usually through shared experiences. When a student can connect a text to something that happened to him or somebody he knows, he is more likely to comprehend it. The teacher demonstrates this while reading. For example, if reading "Snip, Snip ... Snow!" by Nancy Poyda, the teacher may stop after a few pages and say "This book reminds me of the first time I saw snow. I was so excited because I thought I would never get to see snow." Then the teacher will ask for student volunteers who can share their similar experiences. 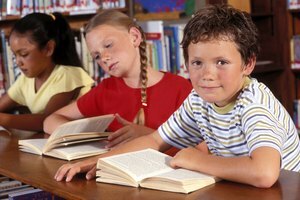 Choral reading is a comprehension exercise that helps children remember words and phrases and experience success as a reader. This is especially helpful for struggling readers. Kindergarten teachers often use nursery rhymes for this activity. They read a few lines, then have the class repeat them. They might also choose books with simple sentences, like Dr. Seuss stories. This activity helps children become fluent, expressive readers. Fluency is directly linked to improved comprehension. Kindergarten students enjoy hands-on activities and teachers often use them to reinforce reading skills. To improve comprehension, students might draw pictures of characters in the stories or pictures that depict the action of the story in the correct sequence. She might also give them old magazines so they can find pictures of people or things that are in the story, cut them out and glue them to construction paper. Then they can retell the story while showing the class the pictures they chose. Hollowell, Karen. "Simple Comprehension Exercises for Kindergarten." Synonym, https://classroom.synonym.com/simple-comprehension-exercises-kindergarten-5740.html. 26 September 2017.